My peerless cousin Jo Anne and I decided to take a tour of archaeological sites in the Four Corners area in the fall. We wanted to spend our "kick-off" day in Monument Valley with a Navajo Guide because we had been told that this would be a once in a lifetime opportunity to learn more about the Navajo (Diné) people and their culture. Monument Valley Navajo Tribal Park is the geographic center of the Colorado Plateau. 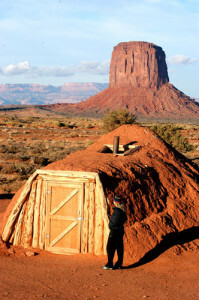 It is also on the northern edge of the present day Navajo Reservation—the U.S.A.'s very own country within a country. Many travelers recognize this iconic Western landscape as being one of the most frequently photographed in the world. Many movies have been shot here. 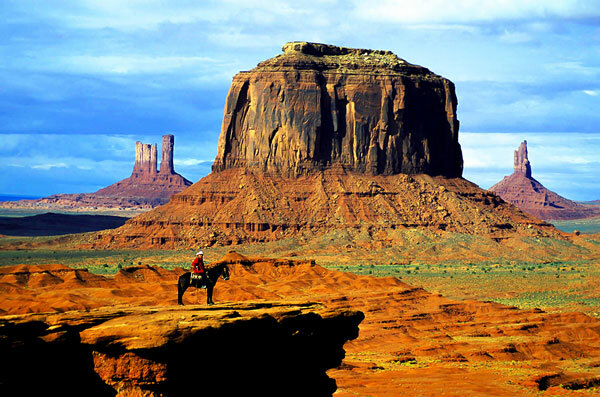 Who that loves the West will ever forget the photo of the Navajo man in a red shirt and cowboy hat, seated on a pony, looking out over Monument Valley from John Ford Point? At that time, I didn't know that Goulding's would thoughtfully provide us with the opportunity to duplicate that photo on our tour the next day. We under-planned our time and distance from Salt Lake City so were not able to visit many of the wonderful Utah sites along the way, (Nine Mile Canyon, Newspaper Rock, Edge of the Cedars, Hovenweap.) However, we did stop in Sego Canyon at Thompson. Here reside ancient pictographs (painted) and petroglyphs (pecked) which were familiar to me, but I had not realized that they were in Utah! Specifically, the large anthropomorphs with "big googly eyes." I've since been told that this is not a representation of an alien astronaut, but instead, more likely, a picture of the rain god, Tlaloc. Who knew? As we drove and it got darker, we realized we would arrive in Monument Valley after sunset. The night was elegant in its blackness and silence. Suddenly, Jo Anne grabbed my arm and said "Deer!" But it sure looked like a herd of horses to me--running full speed across the road in front of the truck! I was glad she'd shouted out. No fences! We must be on the reservation. Goulding's could not be far. Harry Goulding and his wife, Mike, arrived in Monument Valley in the early 1920's and immediately fell in love with the area. 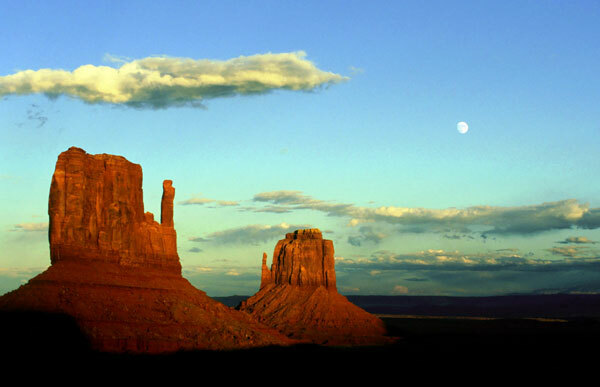 They purchased 640 acres of former Paiute land and began trading with the resident Navajo. Later on, they built a stone trading post and house and began publicizing the beauty of the area to Hollywood, including John Ford. The original trading post has since become a museum. The cabin used by John Wayne during the filming of She Wore a Yellow Ribbon can be seen behind the post. 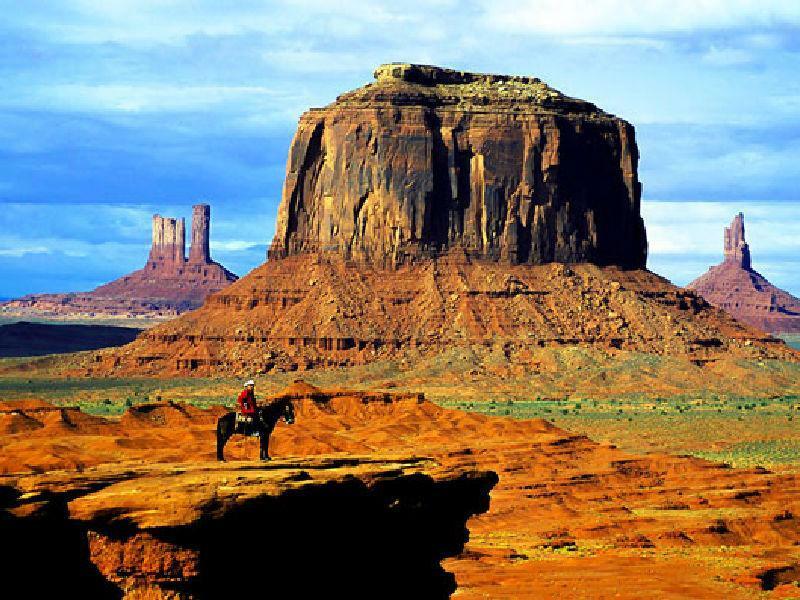 Goulding's offers a number of tours, including a Basic Tour of Monument Valley; Deluxe Tour which includes restricted back-country; Full Day Tour of Monument Valley, back-country, Mystery Valley and lunch; Mystery Valley tour; hiking tour; and a Full Moon Tour. They will also build a custom private tour for four or more! All tours include the entry fee to the Tribal Park, a map, and tickets to the Earth Spirit DVD show. 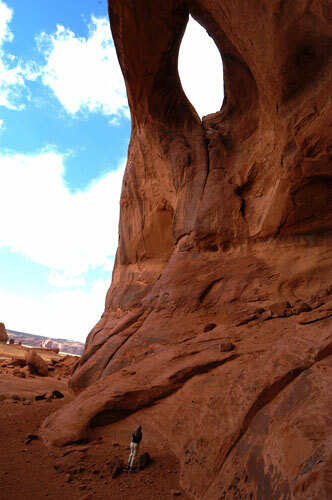 Navajo Guides narrate all tours. 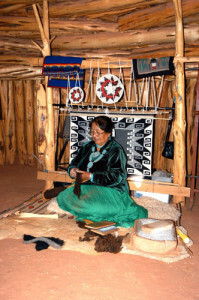 Every tour includes a visit to a traditional Navajo "hogan" home to see a rug weaving demonstration. Also, a short drive through Monument Valley is open to the public, but most of the area is private property and cannot be entered without a Navajo Guide. The next morning dawned clear and crisp. Sitting in the back of the open truck in the shadow, even though it was only October, we were cold enough to wear coats, hats, gloves, and scarves. Miss Carol introduced herself and we were off on the Full Day Tour. We started by visiting areas of interest in the Mystery Valley and then moved on after lunch to Monument Valley. Throughout the day, we stopped frequently for photographs and also learned about summer shelters, how to look for water, how to identify ancient dwelling sites, the uses of local plants, courting and marriage customs and much, much more. Miss Carol was an excellent guide: well informed about the local area, readily able to share her special knowledge, all seasoned with a dry sense of humor. And what a driver! She maneuvered the "rez" roads with ease. Late in the day we met Susie Yazzie who showed us her weaving and spinning. We also met her sheep herd! Miss Carol took us to a natural wind carved hogan (the door of a hogan faces east to welcome the rising sun for good wealth and fortune) and sang us a traditional lullaby. And finally, we had an opportunity to stop at some of the outdoor tables with native artists to view (and purchase!) their art and crafts. We had a wonderful time!